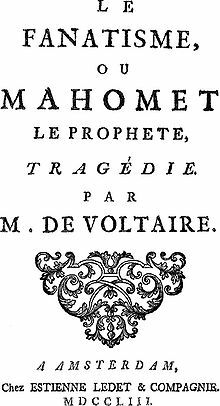 Mahomet (Le fanatisme, ou Mahomet) aka "Fanaticism, or Mahomet" is a five act play by French playwright and philosopher Voltaire that was written in 1736 with its debut performance in Lille on 25 April 1741 and then in Paris on 9 August 1742. — Excerpted from Mahomet (play) on Wikipedia, the free encyclopedia. Omar, General and second in command to Mahomet.